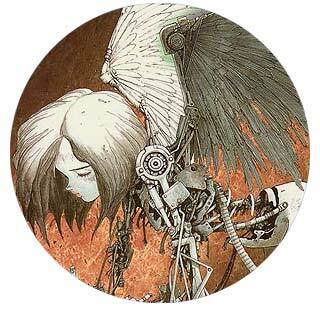 Based on the Yukito Kishiro's manga Battle Angel Alita, this film is a symphony of intense action sequences and shadowy mixtures of color coupled with a darkly cinematic soundtrack. 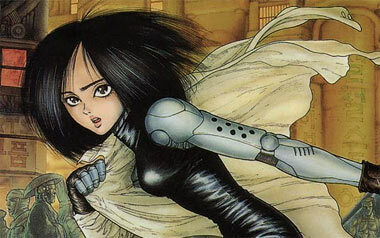 Alita is a perfectly deadly heroine with a leather-clad style that anticipates The Matrix and is now part of the canon of Blade Runner-inspired anime cyberpunk. The action keeps the plot moving at breakneck speed, so character development often seems to happen in leaps; you'll want to read the manga to learn more about Galley/Alita and her world. Nevertheless, we heartily recommend this DVD as a "must see, must own", and the manga series is complex and profound. 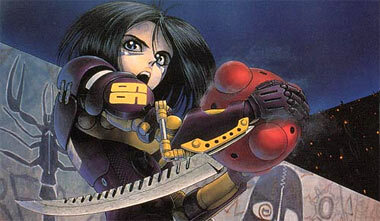 Below: Illustrations from Yukito Kishiro's manga Battle Angel Alita.